Are you sure, you want to add Boundaries to your wish list? 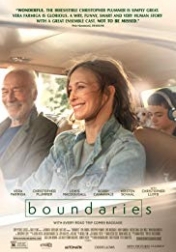 Single mom Laura (Farmiga), along withÂ her awkward 14 year-old son Henry (MacDougall)Â isÂ forced to drive JackÂ (Plummer), her estranged, care-free pot dealing father across country after he's kicked out of yet another nursing home. Â The road trip veers off course when Jack decides to make a couple 'stops' and Henry asks to see his ne'er-do-well dadÂ Leonard (Cannavale), completely upending Laura's attempt to hold her family together and ultimately forcing her to finally see her father for the man he really is. Are you sure, you want to buy Boundaries? Are you sure, you want to order Boundaries ?